Over the summer and fall, New Brunswick residents and visitors may notice signs of scientific research in many New Brunswick waterways including the St. John River and tributaries such as the Kennebacasis, the Miramichi River and Wolfe Point River in Fundy National Park. Amanda Babin, a PhD Candidate with the Canadian Rivers Institute at UNB Fredericton, just finished placing 22 large orange buoys in locations upstream of the Mactaquac reservoir on the St. John River as part of her research project. The buoys mark the placement of data receivers that track the movements of Atlantic salmon as they pass downstream. “We want river users to know what we are doing out there on the water – people are curious about scientific research,” says Babin. Babin also notes that with an increase in awareness of the river research going on around the province, also comes an increased regard for the scientific equipment. “We want boaters to be aware of buoys as they navigate the rivers and especially the Mactaquac head pond. We also want people to know that the data that technology helps us collect is very important to our results and it would be very discouraging to have them go missing,” she continues. Dr. Allen Curry, a Science Director with the Canadian Rivers Institute, and a professor or Biology at UNB Fredericton, is directly involved in supervising and guiding the research projects of almost 30 students this season. “This is an exciting time of year; the students work hard to prepare their field data collection methods and now they go out and contribute to some very high-level scientific research with very practical applications,” says Curry. Dr. Curry is the lead on CRI’s Mactaquac Aquatic Ecosystem Study, which began in 2014 to provide independent river science to the NB Power decision on the future of the Mactaquac hydroelectric generating station and a future river monitoring program. 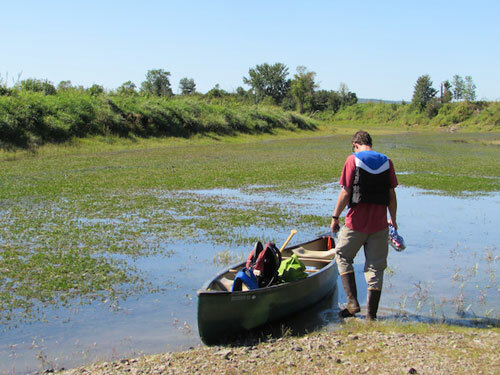 “This is just one example of how students’ research, guided by international river experts, can have a direct impact on a real-word question: how will the river respond to a big change? The students are helping to provide answers,” says Curry. All of the CRI student research in New Brunswick, and rivers across Canada and around the world, goes towards the cumulative science contribution that the international network has been building over their 15 years. Their goal is to produce highly qualified water resources scientists, professionals, and policy makers across Canada and beyond, all working toward making every river a healthy river.